Installing and maintaining your gutters regularly ensures proper drainage and helps you avoid long-term costly water damage. We install and clean gutters properly to make sure there is no debris that can potentially creating blockage. We recommend cleaning your gutters at least twice a year. Once in the Spring after the tree buds drop, and then second in the Fall after the leaves fall down. If there are more trees around the house, you may want to get your gutters cleaned more often. Another important part of the cleaning process is a final water flush to ensure there isn't any blockage further down the line. That's why we make sure and finish every gutter cleaning job with a water flush. 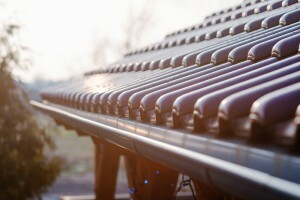 Do you need a new gutter system? Just looking to add gutter guards? Well you can be sure that when you choose Holloway Gutter Corp, you will be choosing the best trained professionals for your installation needs! Whether it is a partial replacement or a full installation, we will give you the best service in the industry. We stand behind our work so much so that if there are any problems after we leave, we will promptly return to correct it at no extra charge. An inspection of the gutter system should be a mandatory inclusion in a homeowner’s routine home maintenance schedule. Ideally, a gutter inspection should be performed twice a year, along with your gutter cleaning service. 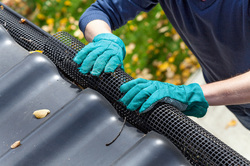 Keep your gutters free from pine needles, leaves, maple seeds (helicopters), animal nests, shingle grit and oil with gutter screens and guards. Holloway Gutter can also help you with common outdoor repairs. Let our professionals know what problems you might be having and we can estimate your job on the spot.